New Delhi, May 22: “Our BSF jawans perform the duty of protecting India’s boundaries and their duty knows no boundary. 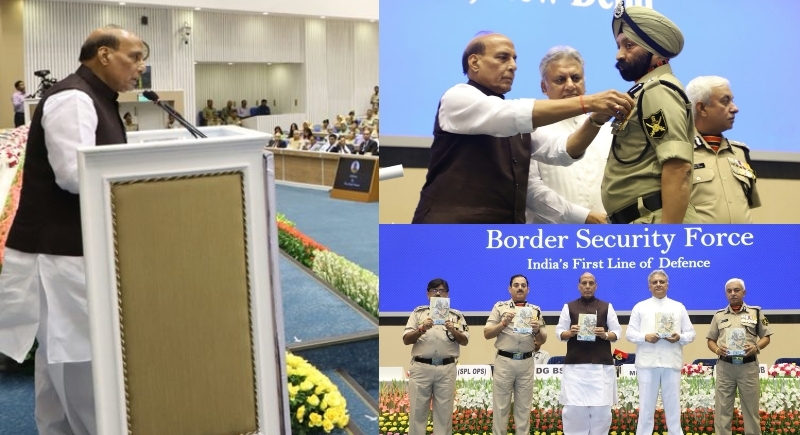 They do not fire the first bullet but they do know how to give a befitting reply,” resorted Union Minister Rajnath Singh addressed the 16th BSF Investiture Ceremony in New Delhi. As Pakistani Rangers continued bombarding on the international border (IB) in Jammu and Kashmir on Tuesday, Union home minister Rajnath Singh said the security forces have a free hand to respond as they deem fit if the neighboring country continued the offensive actions. Further, he elaborated saying that first bullet should not be fired upon the neighbors, but if BSF receives a bullet, no one will ask them why they fired. In a bid to eradicate terrorists and terrorism from Jammu and Kashmir, the Indian security forces were given free hand. Looking at the holy month of Ramzan and Amarnath Yatra, Home Minister Rajnath Singh announced a conditional ceasefire to stop anti-terror operation. Union Home Minister Rajnath Singh also said, most of the borders with Bangladesh and Pakistan have already been sealed. He added that the family of each paramilitary jawan who dies in action will not be given compensation less than one crore rupees. Presenting gallantry awards to jawans and BSF officers, Rajnath Singh also cited that the families of martyrs should not face any difficulty. The Pakistani Rangers have been carrying out indiscriminate shelling and firing in Arnia, RS Pura and Ramgarh sectors in the Jammu and Samba districts since Monday. At least 30 BSF outposts and some two dozen border villages have been targeted.